The development of the new Toyota GR Supra wasn’t driven by simple performance numbers or headline lap times, but a single-minded focus on the feeling you experience at the wheel. With an exhilarating blend of power, balance and agility, it offers enthusiasts the ultimate expression of driving pleasure. The new Toyota GR Supra has been conceived as a sports car in its purest form. Thanks to a combination of a short wheelbase and wide track, light weight and low centre of gravity and highly rigid body, driving enthusiasts can look forward to an exhilarating blend of power, agility and precision handling. To achieve a feeling like this, there can be no compromise. Adaptive Variable Suspension (AVS) is at play in the new Toyota GR Supra. Featuring double-joint spring MacPherson struts at the front and a five-link axle at the rear, you’ll enjoy high levels of comfort when you want to relax and exquisite control whenever you want to play. The new Toyota GR Supra’s front-engined, rear-wheel drive layout ensures it achieves a perfect 50:50 front-to-rear weight distribution. Due to its light but rigid aluminium and steel composite frame, drivers can revel in confidence-inspiring stability, seemingly limitless grip and a neutral handling balance. The new Toyota GR Supra’s high body rigidity allowed for more precise and detailed refinements to the suspension geometry and tuning of the shock absorbers. The front suspension subframe and control arm mounting points have been made extremely rigid to ensure it corners with precision. 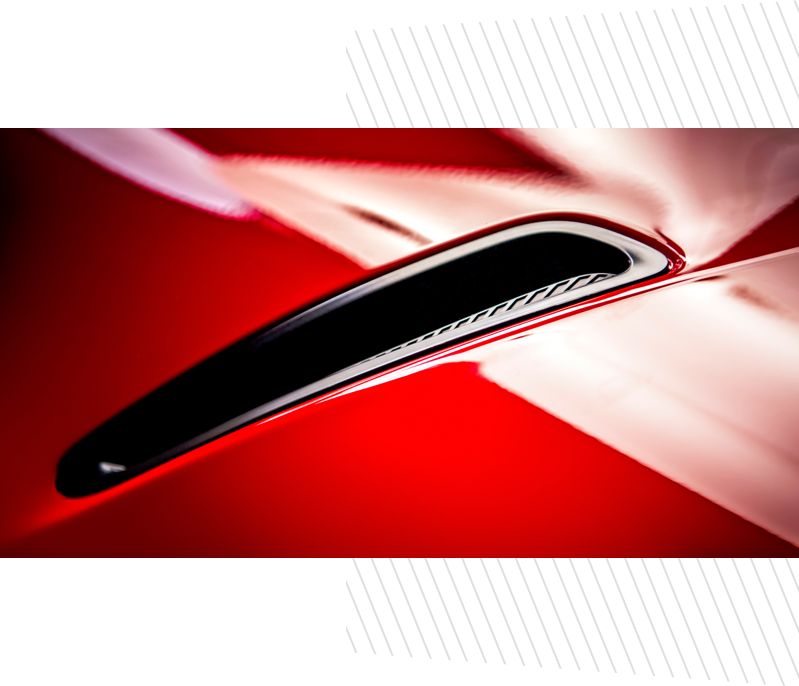 By using aluminium for the control arms and swivel bearings the car’s unsprung weight is reduced, for superior agility and efficiency. The best balance of great agility and superior stability is achieved with a ratio between wheelbase length and tread width of between 1.5 and 1.6. By drawing on world-level motorsport engineering and design, the new Toyota GR Supra achieves the ideal 1.55 ‘golden ratio’, for exceptional agility and stability when driving at the limit. Two driving modes let you tailor the new Toyota GR Supra to your mood. Switch from Normal to Sport, and in an instant engine sound and response, shift pattern, damping, steering and active differential performance are primed to perform. For even greater control of the car’s performance, a special “track” setting can be selected that reduces the level of intervention from the Vehicle Stability System. The new Toyota GR Supra’s standard active differential delivers huge benefits in stability and efficiency when the tyres are at their limits. This effect is felt in all phases of cornering, with increased stability during the braking and cornering phases and maximum grip as you accelerate out of bends. The new Toyota GR Supra’s ultra-smooth six-cylinder engine is matched to an advanced, eight-speed automatic transmission – with paddle shifts on the steering wheel – that provides lightning-fast shifts and precise control through bends, when conditions allow. To help drivers exploit its full dynamic potential, the new Toyota GR Supra's high-performance brakes feature four-pot Brembo callipers, while its19-inch forged alloy wheels are equipped with high grip Michelin Pilot Super Sport tyres. A Launch Control function enables powerful acceleration from a standstill with maximum traction, helping the new Toyota GR Supra charge from rest to 100 km/h in just 4.3 seconds, and go on to a top speed of 250 km/h. With its long bonnet, compact body and double-bubble roof, the new Toyota GR Supra’s standout design is sure to excite driving enthusiasts and capture the hearts and minds of classic sports car fans. 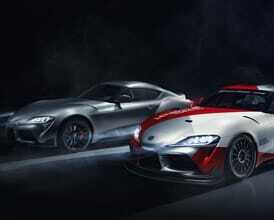 First previewed by Toyota in the dramatic FT-1 concept car styled by its CALTY studio in California, its ‘Condensed Extreme’ design concept blends racing aerodynamics with a modern, powerful look that screams driving performance. 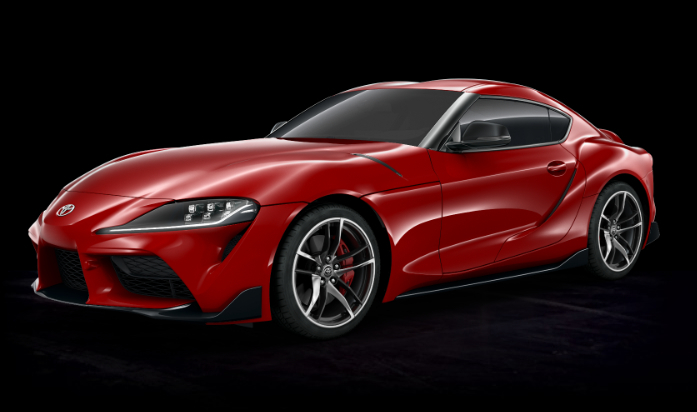 The ‘Condensed Extreme’ design concept refers directly to the new Toyota GR Supra’s packaging. The ‘Condensed’ theme is evident in the relationship between its large-diameter tyres, short wheelbase and overall length, while ‘Extreme’ is interpreted in the car’s wide stance, with tight cabin proportions and a broad tread, contributing to a high level of manoeuvrability and stability. By drawing on world-level motorsport engineering, the New Toyota GR Supra achieves both optimum drag and lift characteristics, as well as an ideal front/rear weight balance. Its distinctive double-bubble roof reduces drag, without sacrificing headroom, while its arching rear lip spoiler suppresses lift. Complementing the new Toyota GR Supra’s wide stance and short wheelbase are imposing 19-inch forged alloy wheels and distinctive six-LED headlamps. In a nod to its racing roots, the rear fog light and reversing lights are formed by dot-LEDs grouped in the centre of the rear bumper. With its driver-focused cockpit, racing-inspired seats and premium technology, the new Toyota GR Supra is the ideal all-rounder, providing GT comfort when you want it, and sports car control when you need it. An 8.8-inch central multimedia system gives you access to navigation, Supra Connect (in applicable markets), music and hands-free calls, while a Smart Entry and Push Start system and large, expandable trunk make daily life easier. 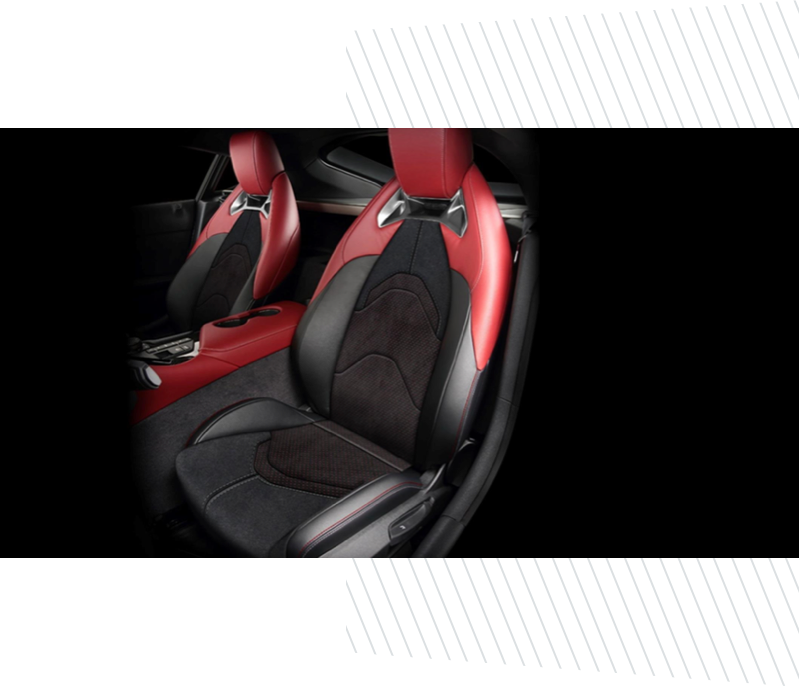 The new Toyota GR Supra’s racing-inspired, power-adjustable (including lumbar support) seats incorporate integrated heating and memory functions. Finished in Alcantara on the Active grade and leather on the Premium and A90 Edition grades, they ensure comfort at all times and excellent support, especially on-track. You’ll always have a clear view of the road in new Toyota GR Supra. LED technology is used for the adaptive headlights, rear lights and daytime running lights, and all mirrors offer auto-dimming, while rain-sensing wipers and a rear-view camera add a welcome touch of convenience. 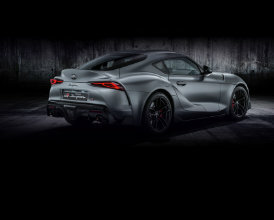 For those moments when you want to settle back and relax, the new Toyota GR Supra Active grade is equipped with a 10-speaker audio system including Bluetooth® and USB port connections, and a central 8.8-inch display to access navigation with Supra Connect (in applicable markets). Premium builds on the Active grade with a 12-speaker JBL premium sound system and wireless mobile phone charger. Being a high-performance sports car, safety is of paramount importance in the new Toyota GR Supra. 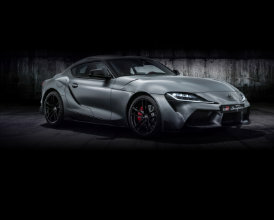 The Supra Safety + package comprises Blind Spot Monitor and Lane Departure Alert, Rear-Cross Traffic Alert, Rear-end Collision Alert, Intelligence parking sensors with Automatic braking and an E-Call function that will send an automatic location alert to the emergency services in the event of a serious collision. All Toyota GR Supra’s are also equipped as standard with Adaptive Cruise Control with stop and go. Influenced by the layout found in a single-seater racing car, the cockpit of the new Toyota GR Supra is designed to put the driver at the centre of the action. Adjustable side bolsters in the seats and thoughtful knee pads provide support when cornering hard, while a digital combi-meter and a Head-up Display (in Premium grade) displays speed, infotainment and navigation clearly in the driver’s eyeline. The new Toyota GR Supra’s asymmetric centre console marks a clear division between the enveloping driver’s cockpit and the more open passenger side of the cabin. The dual-zone automatic air conditioning sits proud of the console, with memory-touch switches for each operation, while the 8.8-inch central multimedia display can be operated as a touch screen, or by using a rotary controller. The new Toyota GR Supra features Active Sound Design, two selectable driving sounds to suit a driver’s mood. For everyday driving, Normal mode provides quiet, refined motoring that’s perfect at the end of a long day, while Sport delivers exhilarating high tones and racing-inspired pops and bangs on downshifts.